What it Is: Exfoliate with our best-selling patented potent alpha and beta hydroxy acid peel that delivers spa-grade exfoliation, revealing a brighter complexion while reducing the appearance of fine lines and wrinkles as well as dark spots and discoloration for optimum age-defying results. Who it's For: Designed for customers of all skin types (except sensitive skin) in their 20s and up. Effective for helping dark spots, discoloration and uneven skin tone and texture. Note: The Juice Beauty GREEN APPLE™ Brightening Collection is not designed for very sensitive or rosacea skin due to the alpha/beta hydroxy fruit acids. If you have this type of skin, see the Daily Essentials Collection (sold separately). 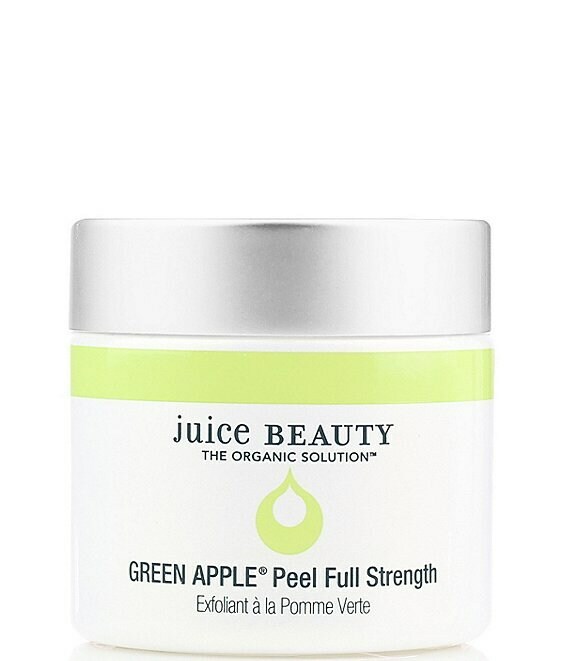 After cleansing with the Juice Beauty GREEN APPLE™ Brightening Gel Cleanser (sold separately) in the evening, apply a generous layer to entire face, neck and décolleté, avoiding the eye area. Leave on for 10 minutes. Flushing and tingling are normal. Follow with GREEN APPLE™ Age Defy Serum and GREEN APPLE™ Age Defy Moisturizer (each sold separately). Use 1-2 times a week at night.